Greater Noida (06/02/2019) : Marking 150th birth anniversary of Mahatma Gandhi – Birla Institute of Management Technology, Greater Noida organized a special talk on “Mahatma Gandhi- Ek Ashambhav Sambhavana” by the very prominent and renowned historian of India, Professor Sudhir Chandra. 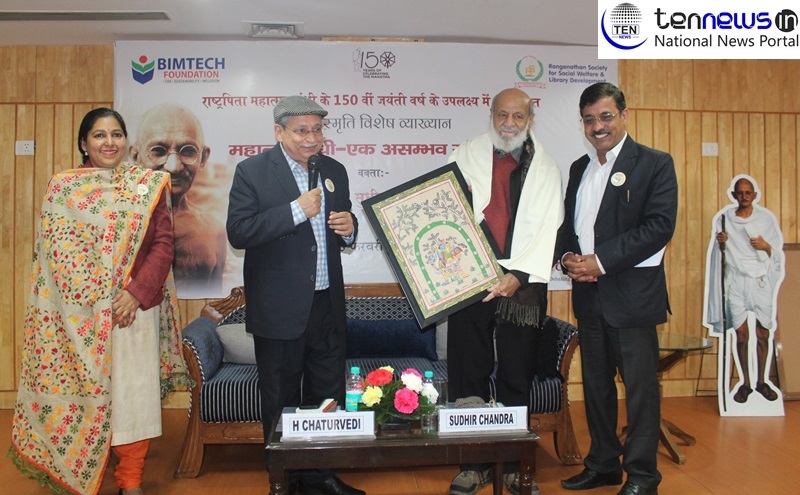 Professor Sudhir Chandra was facilitated by Dr Harivansh Chaturvedi Director BIMTECH by presenting a framed photograph captured by BIMTECH photographer capturing Gandhi ji and his charkha . The talk began with Gandhi ji’s favorite song “Vaishnav Jan To, Tene Kahiye Je Peed Paraaye Jaane Re Par Dukkhe upkaar kare” sang by BIMTECH students. DR Harivansh Chaturvedi in his welcome address shared his own thoughts on why Gandhi’s thought is still relevant for this generation and why his thoughts were accepted as a thought leader in the world. Detailing about this he shared some of the landmark moment of Gandhi ji’s life. He also shared some of the very famous quotes of Mahatma Gandhi which he himself liked very much “Live as if you were to die tomorrow and learn as if you were to live forever”. While Prof Sudhir Chandra in this lecture, he mostly talked about incidents during last year of Gandhi ji’s life and his state of mind. He said “we need to think over this that during his last time after Independence of India Gandhi ji did not want to live anymore and want to die because of the violence and nobody was hearing him. The one thing we never realized that the person who fought with Britishers for 32 years and no harm came to him but Independent India only kept alive him for just 169 days. So we need to think what is the significance of Independent India which had not been able to keep alive it’s Father of Nation for not more than 169 days. At last, students were also given signed copy of book “Ek Ashambhav Sambhavna” by Professor Sudhir Chandra as a blessing from him.